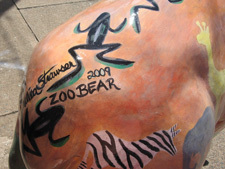 Original artist of Zu-bear Melissa Strawser came to the rescue of her beloved creation when it became obvious that the weather was ruining the original art work. 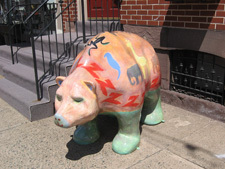 In creating the new and improved Snooooozzzzzzzu-bear, she was inspired by a Southwestern palette for her animal inhabitants. 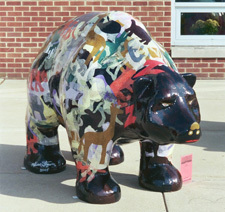 The artists reception, held on May 6, 2005, included a visit to the Bear Fever bear den where the collection of bears waited to be assembled for Arts Expo 2005. 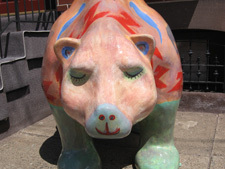 The backs of these bears highlight the details and variety of artistic stylesall beautiful and so very diverse. Student Aishah McNeill (lft in background) chats with library aids Shiela Barton (center) and Marilyn Herbst (rt). On March 26, 2005, I got the pleasure to attend Mrs. Stahl on a second trip to the Bertoia Art Studio. The first time I went with her last fall, we were there to visit Val Bertoia, an artist working with Bear Fever on one of the two Tri-County Chamber of Commerce bears. When we arrived, Val wasn't there, so we got to talk to Melissa Strawser, Val’s associate and a local artist. As Mrs. Stahl and I were talking to Melissa, she became interested in working on her own bear. And so, this second trip with Mrs. Stahl over Easter, we were there to see only Melissa. As we were looking at her bear, sponsored by Zuber Realty, she told us about what she was doing with the bear and how she got her ideas. Melissa explained to us how one night last fall, after we had first talked to her about working on a bear, she said that a dream came to her about it; and when she woke up, she knew exactly how she was going to do her bear. She was going to do a collage of 13 different zoo animals, a theme of nature and animals, using chine collee, which is Japanese paper that has a beautifully unique texture to it. Also, she decided that the feet, face, belly, and tail were going to look more like fur, to give it a realistic look. 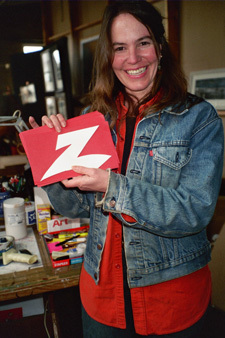 Around the collar she is going to put the Zuber Realty's logo, "Z." Before she started working on the bear, she created a "practice print" which she called "A dream for my grandfather. She plans to bring the print to the Arts Expo along with other pieces of her work. The day we met with her she was getting ready to go to Germany for a show featuring her print work and very excited about her first show. Melissa is also a metal sculptor—an “unforgiving” medium, Melissa says, and you can see many pieces of her sculptures at the studio like her butterfly tree and a dolphin coffee table. When we asked her if she enjoyed working on the Bear Fever project, Melissa answered “yes” enthusiastically. She said she felt liberated from her regular art work—she’d never worked on a canvas like the bear sculpture before--and looked forward each day to working on it. She said that she was most proud of the overlaying effect the Japanese paper had. When the paper was wet, it formed to the shape of the bear. When her bear is finished, it will be totally covered with zoo animals, layers of animals upon animals. and I definitely agreed with her. The reason why Melissa got involved with Bear Fever was because she never says no to anything. She believes that no matter what, things work out so that there is always time for what you really want to do. Also, she told us that Bear Fever gave the people in the community an opportunity to get involved with each other. All kinds of people who are "stuck in their own world,” get a chance to break out and meet other artists and people in their community. Over all, my experience of getting to see first hand how the professional artists were working on the bears was one I will never forget. 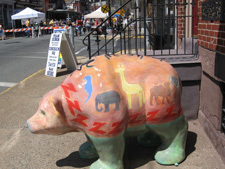 It's one thing to be working with Boyertown Senior High's Art Club on a bear, but to see a professional artist, it brings a whole new light to my perspective. It was a moment I'll truly cherish forever. Hi, I’m Rich Zuber. We at Team Zuber try hard to meet all real estate needs. We keep growing…and going…in order to do that. Our team approach is something I’m proud of. Team Zuber handles every aspect of property management. Richard A. Zuber Insurance Agency offers homeowners, auto, life, and commercial insurance. Appraisals are accomplished by Tri-County Appraisal Services; Manatawny Land Transfer provides title services; a separate division handles multiple details concerning Property Management. But Team Zuber’s ability to provide stability has been critical and is deeply appreciated by our buyers and sellers. Now while we all laughed at his enthusiasm, it occurred to me later that my being there is important; there’s no phantom Rich Zuber…. I’m not just a name on some signs; I’m there…in the homes of my clients and available to my staff…regularly and often…in all five of our locations. I suppose recent weather events around the world…and the resultant changes in the market…have brought all of us a greater need for stability. So much is beyond our control. The power of nature to destroy our entire lives in a moment has taken a front seat in our consciousness, as well as the awareness that we’re all in this [life] together. We’ve got to be there for each other, to help one another when we can. Coaching and my involvement with my church and the Pine Forge Athletic Association is all about working together, sticking out the tough times, bringing our best talents and energy to a project, and then watching the plan come together. I’ve watched this community come together during the Bear Fever project in these ways and I’m happy to be a part of the effort in sponsoring the Zoo-bear. There’s a line from a television show The A Team that was always one of my favorites. At the end of the show, someone always says, “I love when a plan comes together.” That’s my personal mission, what I work for every day—making plans come together. It’s exhilarating…everyday. I don’t kow what the next goal will be in my life, but I’m excited about it already. But make no mistake; my family is what matters most to me. I’m so proud of my wife Dr. Anita Zuber who is such a great role model for women in the workforce today including my two lovely and intelligent and talented daughters, Allyson and Kristen. And I’m so grateful for Erik, my adopted son from Romania, who changed my life and humbled me. Imagine a place of 125 kids with no parents where $5.00 was a fortune. Erik was abandoned on the doorstep of a hospital when he was two days old. When I arrived, I brought him a teddy bear—and in the moment gave him a second chance in life. I’ll never forget the moment I arrived back home and looked around at all the material possessions I had and realized that none of it meant anything to me. What mattered was the second chance I had just given this young boy. I thought of all the second chances people had given me all my life, the turst they had in me, the time they spent with me. And I realized in that moment that’s what mattered. Since then, I look at people differently; I give them a second chance…and try to place the right folks around them—folks who care enough to roll up their shirt sleeves and help out. Erik and I know all about second chances and about people who care about us. And we are always really grateful. Boyertown is a community that cares, that works together for good things. I’m proud to be part of this community, and I’m excited to do my part.